Probably, like us, you: - are a great fan of the Chief Inspector Armand Gamache novels - and think you already know all there is to know about the Louise Penny Inspector Gamache series, right? Well, you may be right or not... We also thought that we knew all about Louise Penny mysteries, but we decided to do a more extensive research and found out many things we didn't know about the author Louise Penny, the Chief Inspector Armand Gamache 14 novels and even about Three Pines. We decided to organize the results of our investigation in the form of a big Quiz dedicated to all the other fans, as a way to share all we found out with the other fans of this great Canadian author. Check the 50 Quizzes questions we present on this book and find out if you are or not an expert on the life of Louise Penny and the Inspector Gamache novels, from the first book to the Louise Penny new book 2018,"Kingdom of the Blind". If you are not an expert yet, this book will help you to become a true expert on Louise Penny Chief Inspector Gamache series. This is an ebook to read and learn, but, you can also use it as a game! In the end of the book you can confirm all the right answers about Louise Penny Three Pines series and author's life, so can use it also as a game to play with all your friends that are also fans of Louise Penny series books. A mandatory book to all fans of Louise Penny, made by fans, to discover more about the life and amazing books of Louise Penny. The Ultimate Quiz Challenge for all Louise Penny fans! To Read, Learn, Play and Enjoy! 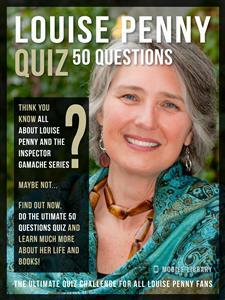 Check the Ultimate Quiz with 50 questions we present on this book and find out if you are or not an expert on the life of Louise Penny and the Inspector Gamache novels!If you are not an expert yet, this book will help you to become a true expert on Louise Penny Chief Inspector Gamache series. This is an eBook to read and learn, but, you can also use it as a game.In the end of the book you can confirm all the right answers about Louise Penny Three Pines series and author's life, so can use it also as a game to play with all your friends that are also fans of Louise Penny series books. In the book "Still Life" (2005), how was Miss Jane killed? Which of these books was published first? "The B eautiful Mystery" "How the Light Gets In"
How many drafts of her books does Louise Penny do before showing them to anyone? Louise Penny suffered of writer's block for how many years? What was the second book of the Inspector Gamache series to be published? "Bury Yo ur Dead""The Long Way Home"